“I’ve always been taken with aphorisms: one, two or three line words of wisdom that cut to the heart of the human condition, words we can think about and use as a reminder of why we’re alive and the importance of love and joy in this world,” says Mr. Perrin. 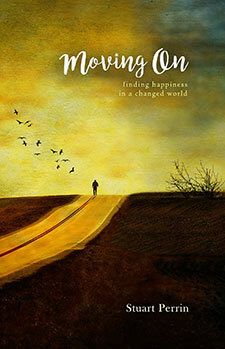 “Moving On: Finding Happiness in a Changed World” touches on the human struggle to make sense of an absurd and often painful life. In those moments when we find ourselves alone and we have to confront an host of anxieties, insecurities, and inner pain, a sentence from a book like “Moving On…” can give insight into what people must do to eliminate stress and find joy and love in day to day activity. It can help us step out of darkness into light. Moving On is a book of street-smart, yet soul-wise aphorisms for those of us that seek peace in the center of an ever-changing world. Author Stuart Perrin assures us that peace and happiness both exist at the heart of even our craziest days, and that each of us can achieve clarity when we need it most. There are countless events that occur in our everyday lives that make the world seem “changed.” Separation, divorce, job loss, politics, illness, and the death of a loved one— all of these are personal situations in which we need a little perspective and wisdom in order to move on. The perfect gift for anyone that has to deal with difficult life circumstances, Moving On offers thoughts both for staying “in the now” and grabbing opportunities that lie hidden right in front of you.